We’ve seen hundreds of ultra-realistic chalk drawings by now. Over the years artists have truly mastered their craft, pushing the boundaries and making their results more realistic by each iteration. In my opinion, today’s featured illusion has pushed the boundaries even further -by replacing the “chalk” part in “3D chalk drawings” with actual flora (and fauna). Observe how strong the 3D effect appears. It’s almost impossible to visualize the scenery as being what it actually is – flat. I think the original artist has started the whole new trend, and hopefully, we’ll be seeing whole bunch of similar illusions in the near future! The only thing I regret is missing the author’s name. I’ve tried using reverse image search which TinyEye provides (as suggested by my audience), yet without any sucess. If you have any clue about the origins of this photo, also where this installment can be found, please don’t hesitate to share it via comments section! Update 07/06/2011 – Thanks to our dedicated fans we’ve managed to identify the author behind this monumental achievement. His name is François Abelanet and may find more photos here. of the buiding behind it! It is on a hill you MOPES! That is so cool! I can’t make myself see it flat! It took a while, but here it is! “Fa-sci-na-ting! I passed by the Paris town hall today, where they currently have an open air exhibit about Paris trees (there are 485 000 of them!). On top of the various – very interesting – explanations, they also installed an anamorphosis work of art by François Abelanet. 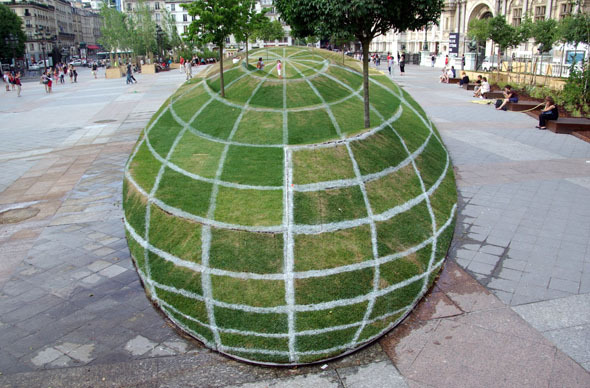 Anamorphosis? Let me borrow Wikipedia’s definition: ” it’s a distorted projection or perspective requiring the viewer to occupy a specific vantage point to reconstitute the image.” Well, since an image is worth a 100 words, click here, you’ll see that what you get in this photo is not really what you see! More, in French, on the Paris Website. Truly awesome, I love it. I did a Google image search with it and came up with this site: http://www.parisdailyphoto.com/, which states that it is near the Paris town hall and the author is François Abelanet. Maybe the world is flat after all! Wow, that’s quite an incredible illusion. It’s really too bad you don’t know who the author is, as he definatly deserves credit. I’d love to be there in real life, so I could see it first hand. Used Google image search to find it. I think even cooler than the illusion itself, is that you really cannot tell how big any of those spaces are except at the top and near the trees. Those bottom patches of grass could be a couple inches long, or a couple feet. You just can’t tell the size of those grass patches! And I think the fact that it was done well enough to render the size of the overall shape (and the individual squares) indistinguishable is even more impressive than just a new type of 3D art of the streets. Awesome!!! OMG looks so amazing and realistic! Thanks for sharing this! This is a nice illusion, but it cannot be flat. If you look at the top of the “sphere”, it obscures part of the building in the distance. Then again, it’s a very poor quality picture. The top of the ‘sphere’ partly obscures buildings behind it. Is it really flat? If it is it must be tilted up at the end far from the camera to cover the view behind. It is not completely flat. The green area ends above people and windows (see rear). François Abelanet. On display at the Paris town hall. Also, in addition to Tineye, Google Images offers a reverse image search by clicking on the camera on the homepage. Actually it’s even better than that, it’s not flat but there are some hills. I think I have another photo showing the spot from another angle, really impressive. you can see it for real in Paris just in front of the Hotel de ville, it is part of a little expo about the trees in the city. Nice one! Btw: Twitter Button would be GREAT! 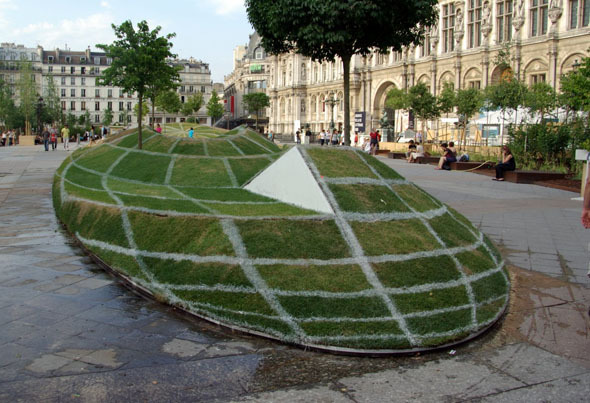 “an anamorphosis work of art by François Abelanet”, to be found in Paris. I can’t make myself see this as plain!! Though it sure is long (the children seem so small). Not all of the space is flat. If you look at the building in the back, some of it is covered by illusion from this angle. I think it is a combination of flat and actual shape. This photo has been taken is Paris, in front of the city hall. and are there different perspectives of this place? Try using google’s reverse image search next time ;) ;) ;) it works like a charm! Hey! This is in Paris! Right by Town Hall. The artist is François Abelanet. It’s part of an exhibit all across the city on trees. When I saw it, I thought it had to end with a hill in the distance since it was rising up above the pavement and people. You can’t unsee it until you see other pictures that show that the ground is not flat. Then, not only is it easier to see, it is even more amazing! This is withot a doubt the best 3D image I have seen. I cannot believe it is flat. The talent of these guys is amazing! It rises above the horizon, so if it is flat it is DEFINITELY also slanted. That’s why it is impossible to perceive it as flat. In many ways, its even harder to do this image than on a flat surface. If you like this sort of art then you need to look up Julian Beever. He is an english artist and he’s known for his chalk drawings on sidewalks all over Europe! He’s the best I’ve seen! I love this one V! yhat is so cool but i was expecting it to be fot a cell pone brand. Easily one of the best illusions ever created IMO. love your igoogle app btw! This is kool! It looks like it’s round (I like the trees) and it’s so big. I think chalkman did it. Ireally like this one! Very Cool!!! I really like this one! Very Cool!!! Lol this is not flat!! ..though its awesome..